(leading to ExpertRating Law Certification LSAT Preparation 1). Taking both part 1 and part 2 will prepare you to perform well on all three question types on the LSAT: reading comprehension, logical reasoning, and analytical reasoning. You will practice on actual LSAT exams from previous years and also learn proven test-taking techniques. Part-II of this course is also available. Both the courses can be bought either separately of collectively by paying the requisite fees of $129.99 each. About the ExpertRating Online LSAT Test Prep Course-I instructors : Scott Hatch has presented paralegal courses since 1980. He is listed in Who's Who in California, Who's Who Among Students in American Colleges and Universities, and has been named one of the Outstanding Young Men of America by the United States Jaycees. He was a contributing editor to The Judicial Profiler (McGraw-Hill and the Colorado Law Annotated (West/Lawyers Co-op) series, and editor of several award-winning publications. He is author of Paralegal Procedures and Practices, published by West Publishing, as well as books on mediation and legal investigation. Lisa Zimmer Hatch, M.A., has been teaching legal certificate and standardized test preparation courses since 1987. She graduated with honors in English from the University of Puget Sound, and received her master's degree from California State University. She is co-author of numerous law and standardized test texts. LSAT Preparation - Course 1 Course requirements: For taking this instructor led ExpertRating Online LSAT Test Prep Course-I you need Internet access, E-mail, and the Microsoft Internet Explorer or Mozilla Firefox Web browser, and the following required text, which should be purchased prior to the beginning of class:10More Actual Official LSAT Prep Test. published by the Law School Admission Council. "Great class. The information, text and instructor were excellent. And most of all, very affordable! See you in LSAT Prep 2!" "I course information is detailed. I found that to be helpful." "I think this course really helped me because it forced me to study. I have found some of the suggestions more helpful than others, but it gave me lots of time to discover what works best for me when I take the test. I'm taking the LSAT next Saturday. I've been scoring in the mid-160s on my practice tests, so thanks!!" "I thoroughly enjoyed this class & it was beneficial for study notes when I decide to retake the LSAT." "This course has boosted my score several points already in just 6 weeks! I am sure that after taking Prep Class II, I will be even more prepared for the LSAT." ExpertRating is one of the world's only ISO 9001:2015 Certified companies (from TUV America) offering an Online LSAT Test Prep -I Course (leading to ExpertRating LSAT Test Prep -I Skills Certification). When you choose the ExpertRating Online LSAT Test Prep Course-I you can be sure that you are buying a premium International certification that is recognized by hundreds of employers and Government bodies in the US and other countries. 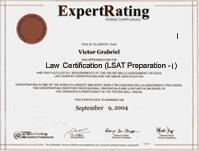 With ExpertRating you get certified quickly online and you are equipped with a store house of information through the in-depth ExpertRating Online LSAT Test Prep Course-I Courseware which has been developed by experienced Law Experts. You can buy this ExpertRating Online LSAT Test Prep Course-I leading to Law certification at a special offer price of only $129.99 which includes the in-depth ExpertRating Online LSAT Test Prep Course-I Courseware and exam fee. This is the best value for money Law Program available till date. You get the following services within the USD $129.99 fee. In-depth ExpertRating Online LSAT Test Prep Course-I Courseware including scenarios and case studies. The process of getting yourself certified is very simple. All you have to do is buy the ExpertRating Online LSAT Test Prep Course-I for $129.99. Log in to the instructor led course using your password. Go through the ExpertRating Online LSAT Test Prep Course-I Courseware (which would take you 6 weeks) and complete the final Law certification exam at your convenience. You can complete the exam within 2 months of buying the Law certification. The result of the exam appears as soon as it is completed, and your Law certificate is mailed immediately. The final exam is fully based upon the ExpertRating Online LSAT Test Prep Course-I Courseware that is provided along with the Law certification. If you have gone through the courseware properly you should not have a problem clearing the exam. The exam consists of multiple choice questions from all chapters of the ExpertRating Online LSAT Test Prep Course-I Courseware. Getting admission in a law school is now easy with the LSAT Preparation course which thoroughly teaches you the techniques and helps to build skills to take the LSAT test. You're taking the LSAT, but that's just a step toward attending law school, which is just a step toward a career in law. Knowing the real reason you're here, this course will start with this first lesson that gives you a peek into what a career in law actually looks like and what your opportunities are. Your LSAT score is just one of many factors that law school admissions committees will consider during your application process. This lesson will go through an overview of the whole process and give you advice on how to maximize your chances of gaining acceptance to the school of your choice. This lesson will explore some of the things you need to know about the general makeup of the LSAT so you'll know exactly what you're getting into come test day. This lesson will discuss what to expect from all question types, not just the ones covered in this first course. You'll discover the basics of reading comprehension, logical reasoning, and analytical reasoning questions, and you'll get an overview of the writing sample. Everything you need to know about scoring procedures will also be revealed in this lesson. You may have heard that you can't study for the LSAT. But that's just not true! There are a bunch of general things you can do to prepare for the LSAT, and the more time you spend preparing, the better your scores will be. You'll also learn how to relax when you start feeling panicky on test day. In this lesson, you'll continue where you left off in the previous lesson by going over specific tips on how to approach LSAT question types, how to eliminate the wrong answers the tests try to entice you to choose, how to guess when you're not sure of the right answer, and how much time to spend on each question. After you've completed this lesson, you'll be ready to learn more about the specific questions, starting with analytical reasoning. The analytical reasoning question type probably worries more potential LSAT takers than any of the others. So in this lesson, you'll learn how to think of this question type as a game—something you'd like to do for fun in your spare time, if you had any! This lesson will examine in detail what you should look for when tackling these questions, and then this lesson will outline your approach. The analytical reasoning question comes in two main types: spatial order and group membership. In this lesson, you'll find out all about each type, complete with examples. You'll also learn about the subsets of questions for each type. In this lesson, you'll learn how to master LSAT group membership analytical reasoning questions. You'll go over the proper diagrams to draw to keep information straight, and you'll go through plenty of practice with detailed explanations. Next, you'll learn how to deal with the spatial order type of question. The diagrams you draw to handle this question type are a little different than those for group membership, so this lesson will go through detailed instructions with lots of practice questions. Knowledge is power, but practice makes perfect! In this lesson, you'll steer through all kinds of LSAT analytical reasoning questions that have appeared on past tests to reinforce the step-by-step approaches you've already learned. You'll practice your skills on actual LSAT test questions and have the opportunity to discuss your efforts with your instructor and other classmates. Your response to the LSAT writing sample doesn't get calculated in your LSAT score, but you have to write it, and the admissions committee does get a chance to read it. So don't slack too much on this task. If the thought of writing a complete analysis of a scenario in 30 minutes or less has you running for the hills, don't despair. This lesson will go through a specific plan for making the most of your time so you can prove to the admissions committee of your favorite law school that you put your thoughts together in a cohesive and interesting essay. Before you impress the admissions committees with your essay, you'll get a chance to wow your peers. For this lesson, you'll read sample essays, and then compose your own and share it with your instructor and classmates for review. You'll also get the chance to read what other test-takers write and provide them with your enlightened commentary!